The 6 Best Bagel Shops in West Virginia! The hand-rolled, boiled and baked bagels of West Virginia are some of the best around. Ranging from traditional treats like an everything bagel slathered with homemade cream cheese, to something as unique as a bagel with pumpkin seeds baked into it, you’ll find it all in the Mountain State. These six bagel shops are the best in West Virginia! Owned and operated by a family of Russian Jewish and Sicilian backgrounds, the Royalicious Bagel Bakery and Deli in Charles Town, West Virginia, offer the best of both worlds. All their baked goods are made fresh daily and they can provide anything you need for that special party, graduation, or family picnic. If you enjoy fresh, hot, organic bagels, muffins, and other baked goodies, then you need to visit Starlings Coffee & Provisions in Charleston, West Virginia. They also serve delicious omelets like their Denver, Greek, or Caprese versions, and the corned beef & Swiss brioche will have you wondering where they've been all your life. If you just can't decide what to order and you want to sample a little bit of everything, check out their Sunday brunch. This quaint little coffee shop offers more than just hot, fresh gourmet coffee. You've not experienced a great bagel if you haven't visited Hot Cup Coffee Shop in Logan, West Virginia. Whether you're a seasoned bagel eater or new to the art of bagel eating, you'll find a taste and flavor that will have you coming back for more. Try their blueberry bagels with cream cheese and your favorite cup of tea or coffee. It's a great way to start the day or end your evening. Have you ever driven three hours just to get a bagel? That's the reaction of some reviewers of The Bakery in Lewisburg, West Virginia. Known for their salt bagels, this little bagel shop also offers delicious menu choices like the hot open-face beef sandwich and chicken salad. They have specialty items like the spinach, cheese, and everything bagel, cranberry, and jalapeno bagels. Fast, friendly service and good food is all you'll get here. Made fresh daily, the donuts, bagels, and other bakery items served at the Donut Connection in Charleston, West Virginia, is a great place to stop for fast, friendly service. From the moment you walk in the door and smell the freshly-brewed coffee to when you walk out with a bagel of choice, your stomach will thank you. The shop is also available to help with fundraising events. 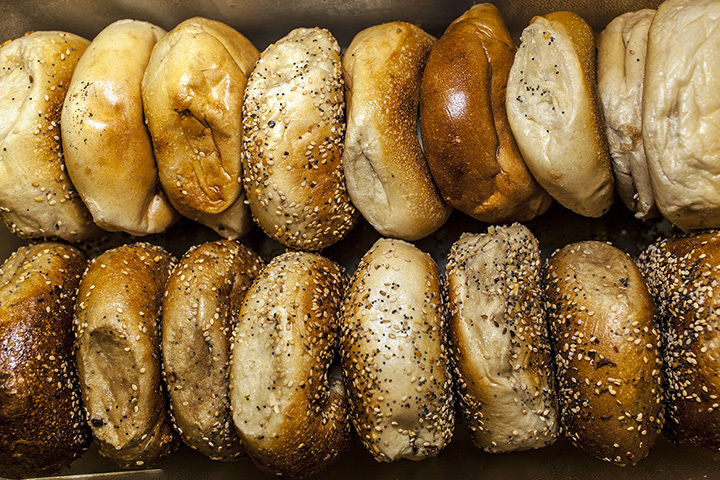 For the best hand-rolled, boiled bagels anywhere, you'll want to stop by and visit the West Virginia 00Bagel Company in Morgantown, West Virginia. From traditional varieties like blueberry, cinnamon, and whole wheat to seasonal favorites like apple pie, cranberry, and protein bagels with pumpkin seeds, you'll find something to satisfy your bagel craving.